Well, it’s the end of the NASCAR season, and time for the biggest nap of the year. This weekend alone, we welcomed three new NASCAR champions and watched legendary names take their final laps. It was a tremendous season, and it’s quite fitting to have such a thrilling and monumental weekend like this year’s Ford Championship Weekend in Miami. It’s a special weekend, and it deserves a thumbs up. Bob Costas doesn’t just roll up for any old occasion. The conclusion of championship weekend means the worst annual tradition in NASCAR: no racing for three months. Sure, we’ve just been through 39 weeks of an intense schedule, racing all over the country (and outside the country if we include the Camping World Truck Series, which holds an event in Canada) — but now there’s nothing to do but discuss silly season gossip, make silly Photoshopped photos, and count down the days until next year’s Daytona 500 (a Denny Hamlin fave). Thumbs down to the next three months refreshing Twitter and NASCAR.com instead of, y’know, watching race cars on TV. Perhaps the only topic that earned more discussion time than the championship battle — and rightfully so — was, of course, Dale Earnhardt Jr.’s final race as a full-time driver. If it didn’t get a little dusty in the room when you watched the No. 88 car inch down pit road, high-fiving every crew member from every team, you’re probably not human. Junior came home 25th in his final start Sunday — fulfilling his goal of running all the laps — and the momentous evening was certainly cause for celebration. Thumbs up for a great ride. We’ll see Dale Jr. in the NBC Sports broadcast booth next year. While Dale Jr. celebrated his last full-time race on pit road after the race, Danica Patrick had a less fortunate evening — her final start as a full-time driver. On Lap 142, Patrick’s No. 10 caught the wall and blew a tire on her car, resulting in a crash and ending her race. It certainly wasn’t the most ideal way to round out her tenure with Stewart-Haas Racing. Thumbs down for a disappointing end to the season. We’re excited to see Danica make one more start, though — next year in the Daytona 500. Her impact on the sport has been meaningful and inspiring. Eight wins. Nineteen top fives. Twenty-six top 10s in 36 races, and 35,000 or so stage wins. The No. 78 team performed when it mattered Sunday. 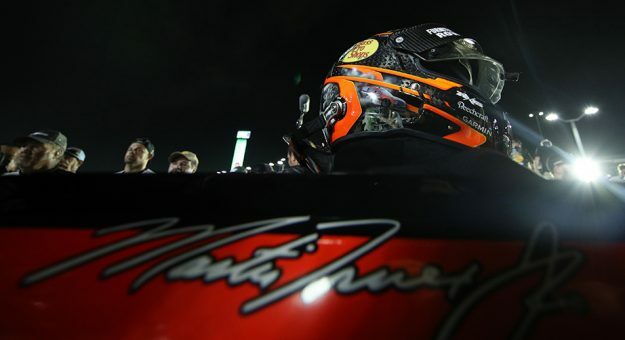 Kyle Busch gave Martin Truex Jr. a run for his money, but Truex ran a perfect race and capped off one of the most impressive seasons in recent memory. They were the favorites for a reason. Maybe it was the playoff beards that gave the No. 78 team an edge. Or the connection between Truex and crew chief, Cole Pearn. Congratulations to @FRRacingTeam, whose congrats, tweets and even mail sometimes gets directed our way. Today is all yours!